Imagine the awe and fear that the Native Indian tribes and early settlers felt when they first gazed on these massive one ton beasts roaming the plains of North American? Buffalo and Bison have become the quintessential symbol of Freedom and the Great American West. Tales of Buffalo Bill and his exploits while conquering these powerful creatures were popular throughout the country and came to symbolize Bravery, Resilience, and the rugged character of the average settler. Buffalo Soldier (1980) is more than just a song from the late Reggae legend, Bob Marley. The term was given to African-American soldiers who fought in the American Civil War. According to some sources, the Cheyenne coined the phrase out of respect for the fierce fighting spirit of the African-American regiments and also a tip of the hat to the soldiers' curly hair, which was thought to resemble the coat of a buffalo's. People often confuse Bison and Buffalo, but while the two are related, they have many distinct features. The first can be found in their skulls. American Bison have smaller horns than buffalos and are usually found roaming the plains of North America. For the most part, Buffalos roam the landscape of Africa, Europe, and Asia and are a keen feature in the lives of countless rural villagers and their folklore traditions. These animals have prominent horns and are domesticated, unlike their American cousins. In rural corners of the globe, Buffalos provide nourishment for many indigenous families. Countless elements are often incorporated into these tattoo designs, each of which adds character and flare to your artwork. To the Lakota Indians of the North American Central Plains, the White Buffalo is highly revered. This majestic animal is extremely rare in nature and seeing one is a sign of Prosperity and Good Luck. In their folklore, the sacred White Buffalo Calf Woman (who is a central figure in spirituality of the Lakota people) taught the tribe timeless pearls of wisdom about the Universe and imparted the knowledge of Agriculture before leaving. She also offered the tribes the ritual of the Sacred Pipe, a sacred ceremony that continues in numerous Native American traditions to this day. White Buffalo tattoos symbolize deep Spirituality, Wisdom, Harmony, and a strong connection to the Native American culture and Nature. Water Buffalos were domesticated very early in Asian and African cultures. They are the source of milk and meat for many rural villages and are sources of cheap, reliable labour for countless farmers. Water Buffalos have the prestige of being an important member of the family and are an integral part of many religious ceremonies and festivals throughout parts of Indian and Asia. In Hindu tradition, the god of Death, Yama, is always depicted riding a Water Buffalo. These tattoos symbolize Abundance, Provision of resources, Power, Strength, and Resilience. 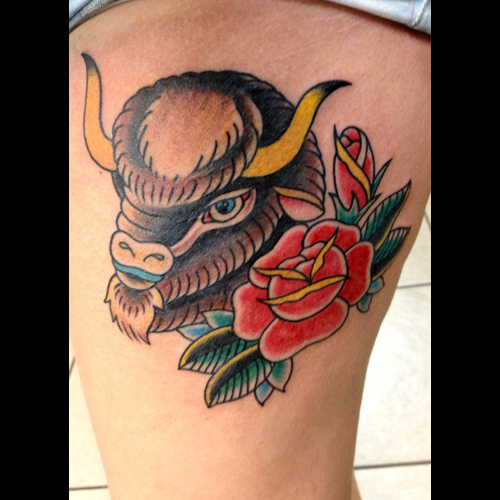 A Buffalo Skull tattoo pays homage to the Native American culture. Many Native Americans place buffalo skulls on their property, since this is thought to bring Prosperity to the household. The skulls are generally sacred and represent a reverence for life on a whole. When choosing a tattoo design that is right for you, keep in mind the tattoo's meaning and where it will be placed on your body. This can be a tricky balance to find, but if you need inspiration, feel free to visit our design page at www.itattoodesigns.com or take advantage of our Custom Design Service, where our team can create a truly unique piece for you.